I don't know when it was, exactly, that I started following Natasha Metzler's blog, but whenever it was, I became hooked. She writes so honestly and so beautifully, and her words about redemption and healing have many times been a catalyst for healing in me. So, when I found out that she'd written a children's book for Christmas, I signed up for the "launch team;" both because I wanted to give back to such a wonderful woman... and also because I just really wanted to read the book! I was not at all disappointed. 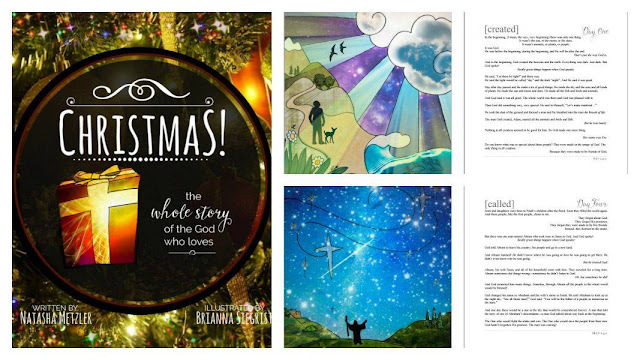 Natasha's beautiful writing, her commitment to Truth, and her inspirational voice shine through in Christmas!. Christmas! includes 25 well-known Bible stories, from creation to the resurrection. 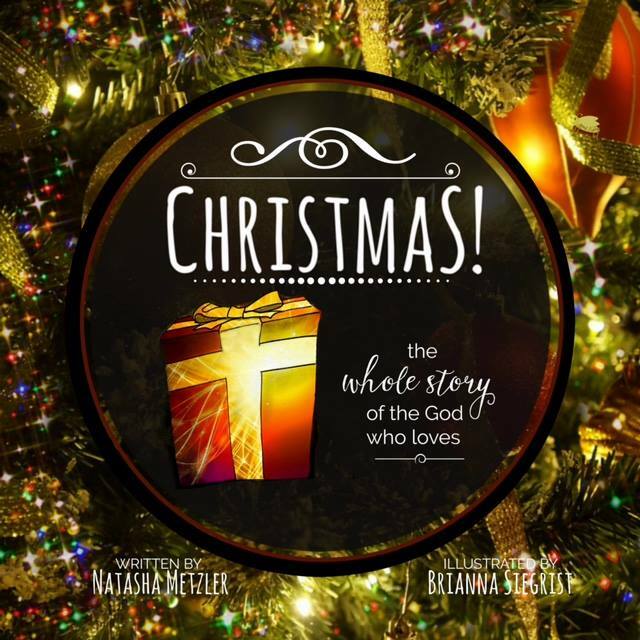 Natasha does a wonderful job of connecting each story to the overarching theme of the Bible: the God who loves. She explains each story in language a child would understand, without watering down the powerful truth of God's love leading up to the cross. One thing that I really liked about the stories that are highlighted in Christmas! is that she included some biblical stories that you don't usually see in children's books (like the story of Hosea). She deals with delicate topics in a very tactful way, and uses the stories you don't typically see to really enrich the understanding of the redeeming love of God. The illustrations are unique- I really love the textures that are used. The pictures are interesting, vibrant, and illustrate the Bible stories, but are abstract enough to spark imagination. The only thing I didn't enjoy immensely about Christmas! is, well.... it's title. I'm afraid that with a title like Christmas!, this wonderful book may be packed away with the tinsel and reindeer jammies, which would really be a shame. While there are 25 stories (perfect for reading one story a night leading up to Christmas), this book is definitely not only a Christmas tale- it's really more a story-version of a children's Bible. I'd recommend this book, at any time of the year- and I'll also be purchasing a hard copy for myself to add to my little collection of children's literature. If you'd like a copy of Christmas!, you can you can buy it on Amazon now! DISCLOSURE: I received a digital copy of this book to read and review. No other compensation was provided. You may see a full disclosure by clicking on my "About" page. I will only promote products that I use, enjoy, or take a shine to. All opinions and reviews are my own and are not influenced by any compensation I may receive. Thank you so much, what a kind review. I'm so glad you and your children enjoyed it! Honestly, we had the HARDEST time trying to decide on a title. Got any great suggestions? Maybe sometime we'll release a year-round version! I can totally understand the trickiness of coming up with a title... and no, no suggestions, because titles are hard! Haha! This would be the PERFECT gift for my 3 year old niece for Christmas! Thanks so much for sharing! I have plenty of little girls that love to be read to. We also read Christmas books all through the year. I agree. Don't shelf it until the next year. :) Thanks for sharing. Now I have a new book to look up for my girls. It's really a wonderful book.Natasha does an incredible job of highlighting the recurring themes and images in the Bible in a way that little ones can understand. Thanks for stopping by, Tammy! Oh, my word. This review made me smile SO MUCH! :) And, as Brianna said, we had the WORST TIME with the title! Ha. But hopefully people will take your advice and not pack it away with the tinsel. I was thinking the very same thing as I read your description of her book! Why is it titled that? Does it string all the stories together to bring the kids through to Christmas? Huh. Well, no matter the title, it really seems like an excellent book! I think this would be great for my niece's daughter! I think the idea is to read the book from December 1-Christmas, one story a night. It totally makes sense to me to use it that way, but I feel like it should stay out and get read all year long! =) It's truly a wonderful book, and so beautiful! And, a bonus-- it also has hidden little pictures of bugs (like an 'I Spy' book)!